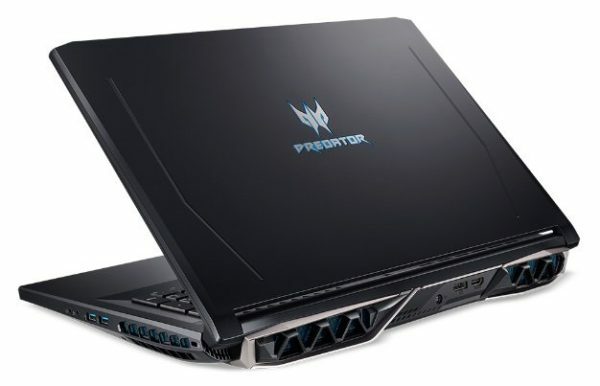 The Computex 2018 is the opportunity for Acer to announce that its Acer Predator Helios 500 gaming laptop will also be available under any AMD solution with a Ryzen processor and a Vega 56 graphics card. At the end of May, Acer introduced its new high-end gaming-focused flagship with its Predator Helios 500 featuring a Coffee Lake Hexa Core i9 processor and an NVIDIA GeForce GTX 1070 graphics card. From now on, Acer specifies at Computex 2018 in Taipei that its Predator Helios 500 laptop will also be available on the AMD platform . This will result in the presence of a Quad Core Ryzen 7 2700U (2.2 GHz) APU (Accelerated Proccessing Unit) processor with Vega 10 graphics. And next graphics processing, the NVIDIA GPU will give way to a dedicated graphics card AMD and specifically the Radeon RX Vega 56 8 GB GDDR5 dedicated. While the G-Sync technology is present under the Intel / NVIDIA solution, here under AMD platform it is the Radeon FreeSync technology that takes over to improve the rendering in the games and in particular eliminate the artifacts via a synchronization at the fair between the Radeon RX Vega 56 and the screen. For the rest, the options look similar with 16GB DDR4 RAM as standard (64GB max) and hybrid storage. In this area, up to 2 M.2 NVMe PCIe SSDs configured in RAID 0 and up to 2 TB of hard disk storage can be found. The display is entrusted to a 17.3-inch IPS screen, either 144Hz Full HD (1920×1080) FreeSync or 60Hz Ultra HD 4K (3840×2160) FreeSync. The cooling is provided by the combination of AeroBlade 3D fans with metal blades and 5 heat pipes while audio side, there is a solution 2.1 Acer TrueHarmony Waves MaxxAudio. The Acer Predator Helios 500 with 32GB DDR4, 256GB SSD, 1TB hard drive and 74Whr battery could be taken in hand by our colleagues. Their test under the game Far Cry 5 in Full HD and Ultra with FreeSync reveals a frame rate set to 80 fps , while under the same conditions a GTX 1070 desktop climbs to 90 fps against 70 fps for a GTX 1060 6 GB of office.